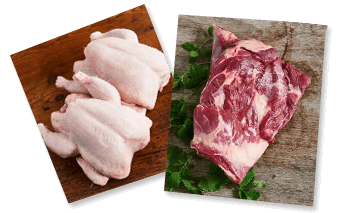 Take a look at our butcher’s suggested cooking times for our most popular Swiss Farm joints. We recommend cooking it for 50 minutes per 450g on 150c/300f or gas 2. Our pork legs should be cooked for 40 minutes per 450g on 150c/300f or gas 2. We suggest cooking your pork loin for 35 minutes per 450g on 150c/300f or gas 2. Cook your lamb on 200c/400f or gas 6. For rare cook for 20 minutes per 450g, for medium cook for 25 minutes per 450g and for rare cook for 30 minutes per 450g. For best results, slow cook your lamb on 150c/300f or gas 2 for 40 minutes per 450g. Our chickens are slightly larger than normal and should be cooked for 20 minutes per 450g on 180c/350f or gas 4. We recommend cooking your gammon on 180c/350f or gas 4 for 20 minutes per 450g.